I seriously cannot believe it's November already! 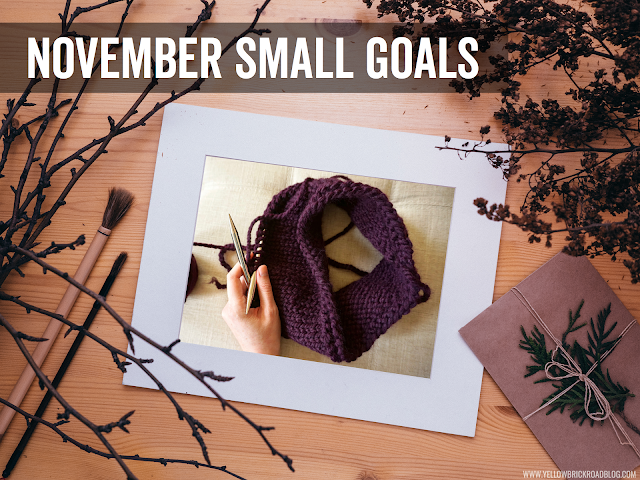 I'm linking up with Jennifer from The Yellow Brick Road to share my monthly "small goals"- be sure to head on over to her post to read about what she's up to as well, and if you'd like, link up a post of your own or share your goals in the comments! So on with this month's goals! I'm not going to go crazy and think I will get all of my shopping done, but I would like to get started with at least a couple of things that I already know I want to get. That way I can focus on figuring out the presents I haven't decided on, and check one more thing off the always-too-long holiday list! If you're shopping for your kids like I am, you might like this holiday shopping guide from Modern Parents Messy Kids. I found it a couple of years ago and I always get a few great ideas from them! These have got to be two of my least favorite teacher tasks, and they'll both be happening this month! Perseverance is all I ask for. Stay in touch! Sign up right here for the Organized Chaos newsletter and get ideas for home and school sent straight to your inbox.